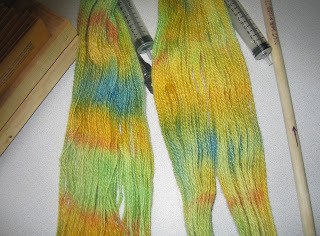 I have had a dye bug going on the last couple of weeks, it has been getting stronger and stronger as the days have gone by until finally, yesterday I picked up a 'Crochet' magazine at the Book Store in Elko and saw this pattern... It is done in Tunisian Crochet, a method which is a cross between crochet and knitting, it doesn't use quite as much material as crochet does, but the finished product is usually pretty thick and heavy. It is like crochet in the fact that you use a hooked needle, double ended and usually very long (see last picture), but like knitting in the fact that you don't turn your work. I don't remember if I mentioned it, and I don't want to go back and look just now, the Carson Sierra Spinners and Weavers Guild have asked me to teach them about tunis sheep and what they are good for. I have someone weaving a sample, another knitting a sample, hopefully Mim has found the time to try to felt some, and I am to make something crocheted and something Tunisian crocheted, all with tunis wool. 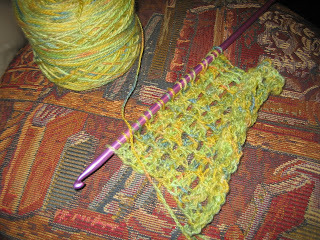 I decided this scarf is what I am going to make to represent Tunisian crochet. 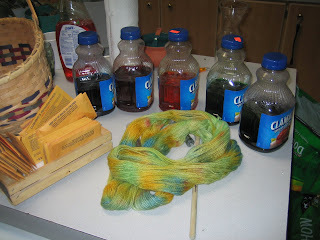 ...the colors on the 'top', or the side the was on top when I applied the dyes, are distinctive and bright, while on the 'bottom', they are muddled and muted. How do you all avoid doing this?? 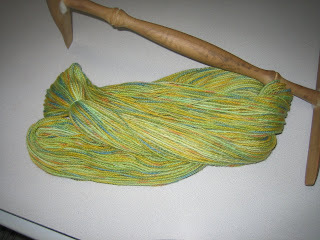 Anyway, it turned out alright after I dried and re-skeined it. Not as blue as I had wanted but I am learning. This is the beginning of the scarf. Tunisian crochet tends to curl a bit...actually a lot usually, but it isn't too bad in this case because it is a lace pattern. 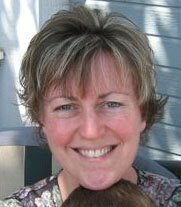 I'm impressed with EVERYthing you did/are doing! Great job the scarf pattern is beautiful too! and your Tunis (maybe) roving felts wonderfully!! Not at all like a 100% Tunis would I'd bet. It felted very tight, strong and soft. I bet it felted faster than anything I've ever done.